The scar of I-980 is a visible moat splitting Oakland in two. Many creative Oaklanders have proposed varied solutions to the problem. One of the most common ideas is to create an elongated cover or deck over the “depressed” below-grade freeway to allow open space or buildings to bridge the gap. Called by many different names: decks, caps, lids, platforms or covers, the common thread in all examples is a wide bridge structure covering an urban highway to help reconnect neighborhoods while maintaining freeway traffic below. Proposals for I-980 include Bryan Grunwald’s plan to deck I-980 for an Athletics ballpark. Although the first decks were built in the 1960s and 1970s in Philadelphia and Seattle, in the past twenty years American cities as diverse as Columbus, Ohio and Dallas have used decking projects to mitigate the negative impacts of urban highways. Many more lids have recently been proposed, some such as Glendale, California’s “Space 134” have gained traction, and others have failed to stick (Chicago’s New West Loop, Sacramento’s Riverfront Connection and Kansas City’s South Loop Link). Although decking over the highway may seem to be a valid compromise to improve local connectivity while preserving regional freeway access, building a lid over the depressed interstate would be an expensive strategy that would yield far less benefit for Oakland than other possible approaches. The Federal Highway Administration’s National Tunnel Inspection Standards define decks over highways as tunnels if they are greater than 600 feet long. The I-980 corridor negatively impacts 17 blocks totaling 5,280 feet in length between West Grand Ave. and I-880. A modest, but economically feasible approach might make a deck covering 25% of the length or 5 blocks (1,300 feet). Despite the short length current Caltrans rules would define such a deck as a tunnel (pdf, p.2-5). The National Tunnel Inspection Standards typically requires expensive mechanical ventilation and dedicated on-site management staff for tunnels (section 2.3). A cap over I-980 would need to meet the same expensive maintenance and oversight rules as the Caldecott Tunnel. Lids are typically topped either with parks or small structures due to the cost and complexity of structurally spanning large distances and bearing heavy loads. Parks with substantial vegetation such as trees must have a more expensive deck to support the weight of the necessary soil. A freeway deck that can support buildings must be dramatically stronger, and is much more expensive to build. Downtown Washington, DC’s “Capital Crossing” is 1,300 feet long, with 12-story buildings in three blocks of development. The deck alone is costing $400 million, while the developer is paying $60 million for air rights. Although the project will create 2.2 million square feet of office space, it will cost $1.5 billion in total. Such a project only works where land values are astronomically high. Oakland does not have lease rates high enough to make such a project feasible. The most efficient freeway caps function as wide bridges with well-designed surface amenities. Highway caps are usually implemented over subsurface (or trenched) freeway corridors without entrance and exit ramps. However, I-980 freeway entrance and exiting accounts for 25% of the I-980 corridor length between Grand Ave. and the Nimitz Freeway (I-880) and carries the majority of traffic on I-980. Exits are not compatible with caps since the gradual slope of a ramp prevents capping for a long horizontal distance. Preserving the heavily used I-980 ramps would limit deck length to 650 feet — a half block on either side of 14th Street , and a block between 17th and 18th Streets. The costs for such a small length outweigh the benefits: it is no coincidence that a recent study by the Trust for Public Land’s Center for City Park Excellence notes that the average highway deck covers 1,620 linear feet of highway. ConnectOakland has determined that the existing configuration of I-980 and probable construction cost makes decking over the highway infeasible. Any mitigation of such a large piece of infrastructure will have a proportional cost. However, cost must be considered in terms of benefit to the immediate community and to Oakland. 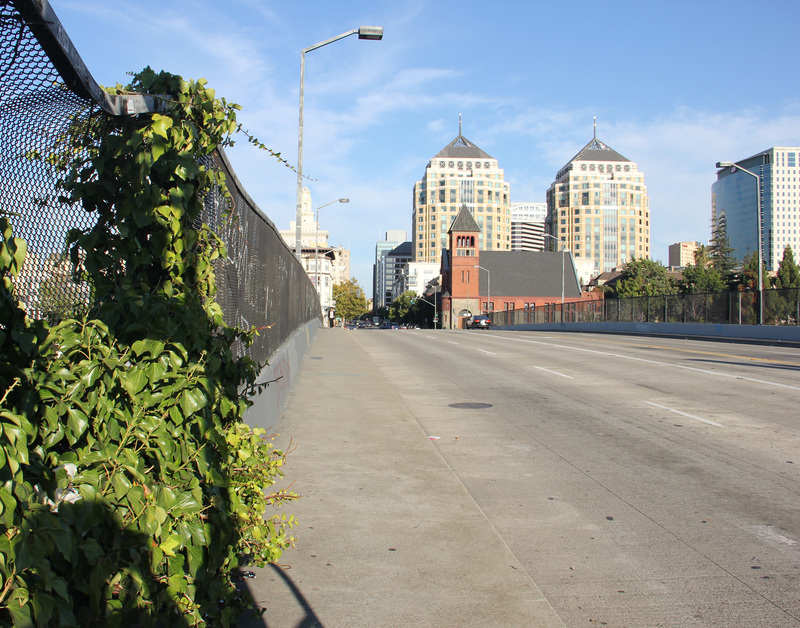 Using the current proposal to deck the Hollywood Freeway in Los Angeles for comparison, Oakland would likely spend upwards of $300 million solely for the benefit of 1.5 blocks and the preservation of an underutilized highway. Such an expenditure for a lid would not free any land for housing or permanent jobs, nor would it reduce regional gridlock since I-980 does not significantly contribute to regional traffic flows. The existing traffic could be easily accommodated on a boulevard and reconstructed street grid that would add only five minutes to a trip between I-880 and the CA-24 interchange. The decision to use a lid to preserve the current I-980 configuration prevents development on 6 acres of underutilized land around the flyover ramps to I-880 and would continue to blight Jefferson Square Park. How is the ConnectOakland Vision different than a highway lid? The article says precious little about how air rights sales could go towards paying for a deck. A shame that such a logical move would be put aside for what appears to be another developer giveaway, like New Haven, CT’s giveaway of Route 34 freeway plots at $1 apiece. Also, the article says nothing about the much needed reconfiguration of the access ramps to a far more pedestrian friendly center loader configuration. Also overlooked is how a deck could be done in stages. Why not make a partial deck? Extend the cover over most of the interstate but leave a sufficient gap in the center to allow ventilation and eliminate the costs associated with a tunnel. Such an approach would eliminate most of the decking cost and the noise from the roadway. Might even be able to incorporate some kind of cupola/ventilated ridge effect. The largest obstacle to a decking strategy on the I-980 corridor is current traffic use. The majority of cars using I-980 are not using 980 as through traffic, but are using it as an extended ramp to/from downtown Oakland. If you look closely at the geometry of the existing ramps, decking is only feasible at two locations — the blocks between 11th and 12th and 17th and 18th. The most important current use of this highway is the ramps, so removing any ramps to deck the freeway would be an expensive project that would result in worse outcomes for all users. We believe that the most efficient way to connect West Oakland, to increase mobility, and to reduce gridlock is to connect the regional highway system into the grid at more than the existing 4 locations while using the 980 corridor as a multi-modal spine to move 4x the number of people in the same space.